This summer for me is a time of exploration in my own country’s backyard and to my delight, I didn’t have to venture far to discover something extraordinary. Lavender fields! Laveanne Lavender Fields is about an hour away from Toronto. My friend Karolina joined me on this adventure one warm sunny July day. We decided to take the scenic route to get to Laveanne, as opposed to the highway and we were in for a treat. We not only passed by little charming towns, but also saw so many greenery and rolling hills. The further away we were from Toronto, the more surreal it felt that we were travelling somewhere abroad. When we stepped onto the property of Laveanne, we felt like we were transported into the lavender fields in Provence, France. The view of more than 10, 000 lavender plants was breathtaking and the fragrance of them were definitely in the air. At Laveanne, July is blossom month. I was glad that I took some time out during July to visit this lovely haven with Karolina. We started our early morning at the charming boutique and were in heaven browsing through so many lavender products, mostly made on site. Then we strolled through the plant nursery. Finally we stopped in front of the big maple tree outside and were greeted by our yoga teacher, Elizabeth. She guided us on a 60 minute gentle yoga class outdoors and then a 30 minute meditation walk through the lavender labyrinth. Elizabeth gave her students an option to walk through the labyrinth barefoot or with shoes. I chose barefoot, so I can feel more connected to nature, and at the same time draw energy from earth, which is a practise known as “earthing”. I loved how earthing was combined with the walking meditation here! At the end of yoga class, we visited the pop-up restaurant on the terrace, overlooking the lavender fields, and enjoyed a variety of lavender infused food. Everything was so delicious! 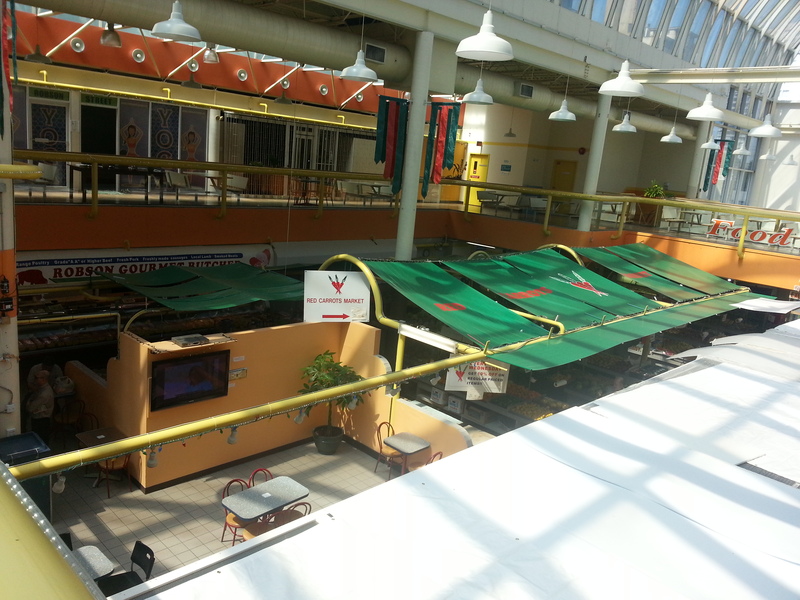 We originally anticipated spending a few hours here and ended up spending the whole day! We took time to stroll through the fields, take photos, and bask in the sun on one of the benches. Time seemed to just slip away quietly in this beautiful and tranquil environment. In the words of Karolina, “I felt like I was at a spiritual retreat.” Truer words were never spoken. Laveanne is a sweet haven where one can find peace and beauty away from the hustle bustle of city life, and feel rejuvenated body, mind and spirit at the end of the visit. They say no two sunsets are ever the same. Through travelling and living abroad, I’ve discovered that I love watching sunsets, whether it’s strolling down the streets in Taipei, biking in New Zealand’s countryside, or making an event out of it by watching it in a famous scenic spot. I find the waiting period between day and night where I can observe the sky’s changing colours very calming for my body, mind and soul. There is a respite from the busy day to fully relax and to be truly aware of my surroundings using all my senses. It is a time where I can check in with my breath, a gentle reminder to live in the moment and appreciate the beauty of nature. To me, the sunset is the moment where magic and peace happens. Walking the 704 steps up the Eiffel Tower, instead of taking the elevator, during late afternoon to catch the view of the whole entire city during sunset is well worth it! In my opinion the best view of the city during sunset is not on top of Taipei 101 but at the top of Elephant Mountain. Don’t be afraid of the daunting steps of the Elephant Mountain hiking trail. A mere 15-20 minutes hike will take you to the serene resting spot of big rocks where you can sit and watch the sunset, or the pavilions where you can stand and watch it. As the sun goes down, it casts a golden hue to the river, therefore it’s also known as the Golden Riverside. Visiting the Tamsui Old Street Night Market, which is right next to the river, will be the perfect end to the night! I was on the tour bus during traffic jam when I saw this beautiful sunset over the Han River. I was standing on the rooftop of my hanok (traditional Korean guesthouse) in what was once known as the ancient capital of the Silla dynasty. The sunset was stunning as I could also see the ancient style roofs too! While driving down The Great Ocean Road, making a stop at this famous place is a must and seeing the sunset is like icing on top of the cake! This sunset was simply awe-inspiring. Like Guanshan in Taiwan, be prepared for even bigger crowds! Another name for this area is Red Centre, as the vast land is covered by endless red rocks, soil, sand and mountains. The wild beauty of the Outback has truly captured my heart and anywhere you stop your car to see the sunset is gorgeous, as can be seen in the photos below. Many people travel to the Red Centre to see Uluru (Ayers Rock), plus the sunrises and sunsets as backdrops. I was lucky to be able to see two sunsets of Uluru at different angles. The first day I saw the silhouette of Uluru against the sunset backdrop and the second day I saw it glowing red as the sun went down. This is the perfect spot for watching the sunset on a beach and then seeing the cute little penguins come ashore after the sunset. Cameras are not allowed to take photos of the penguins, because it will scare them. Two words to describe the sunset here with the Otorii gate: magical and tranquil. Most people come here for a day trip so by the time it’s sunset they leave. Therefore, it’s extremely peaceful and quiet observing the changing colours of the sky with a small crowd of people. I highly recommend at least an overnight stay on this beautiful island at a traditional Ryokan (traditional Japanese inn). Vancouver is known as the yoga capital of Canada. According to my wonderful yoga instructors, literally, in every corner you walk to, there’s a yoga studio tucked in somewhere. True enough, if you’re in the heart of downtown Vancouver, you’ll find a yoga studio somehow and somewhere. While staying in Vancouver a few months ago, I didn’t want to miss out on trying a yoga class. After all, I was in the yoga capital of Canada! In between my packed itinerary, I managed to squeeze in a little time for some yoga. To my joy, I found one a few steps away from my hotel on Robson Street, west end of Vancouver. 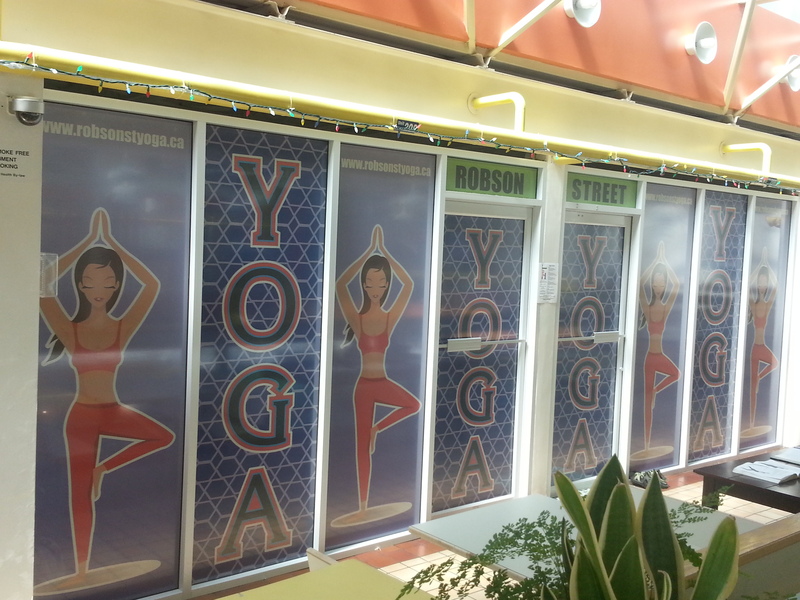 The location of this yoga studio is so discreet that if one passed by it, you wouldn’t notice it. The outside studio sign is mixed with other signs. 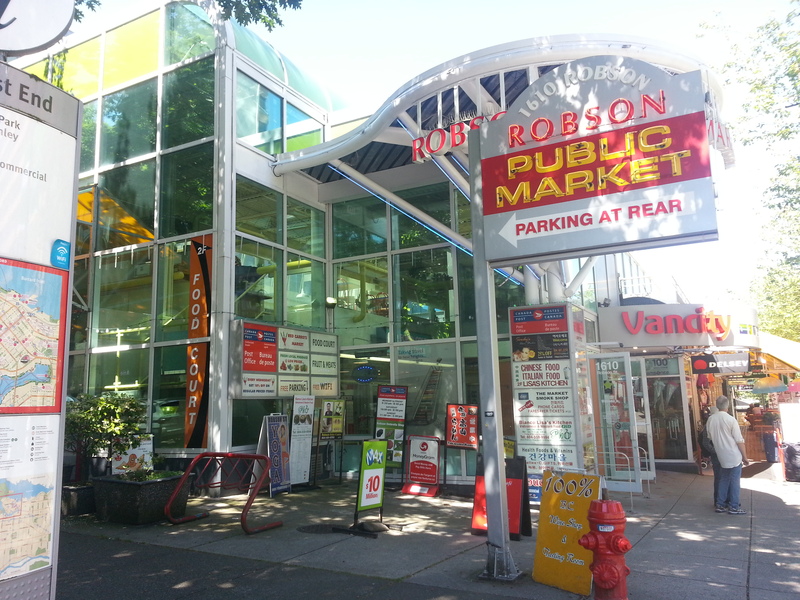 It is located in a little market/plaza/mall called “Robson Public Market”. When I entered this building, I had no idea what to expect. I only had a feeling it wouldn’t be like the fancy studios that I’m used to due to its location. 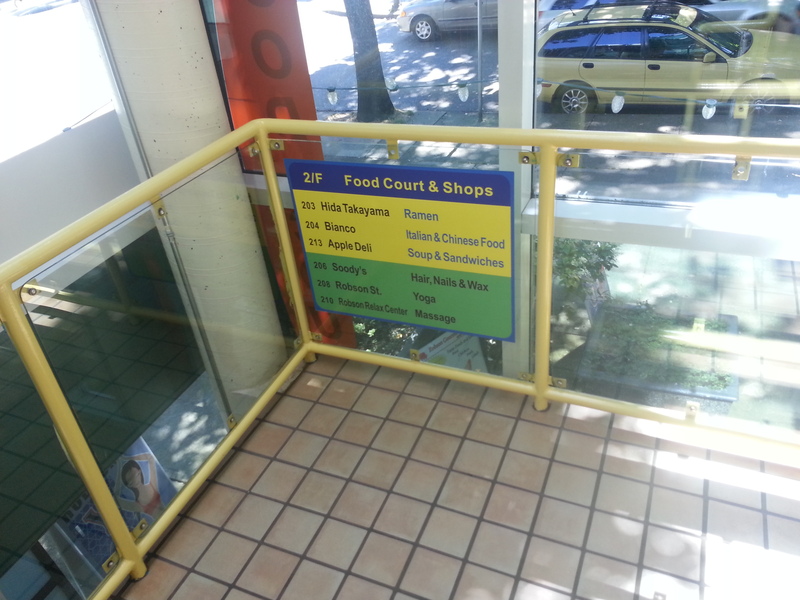 Robson St. Yoga is on the second floor, above the produce market. Yogis are greeted by this nice entrance with its logo sign plastered at the front, and leave their shoes outside before entering the yoga space. 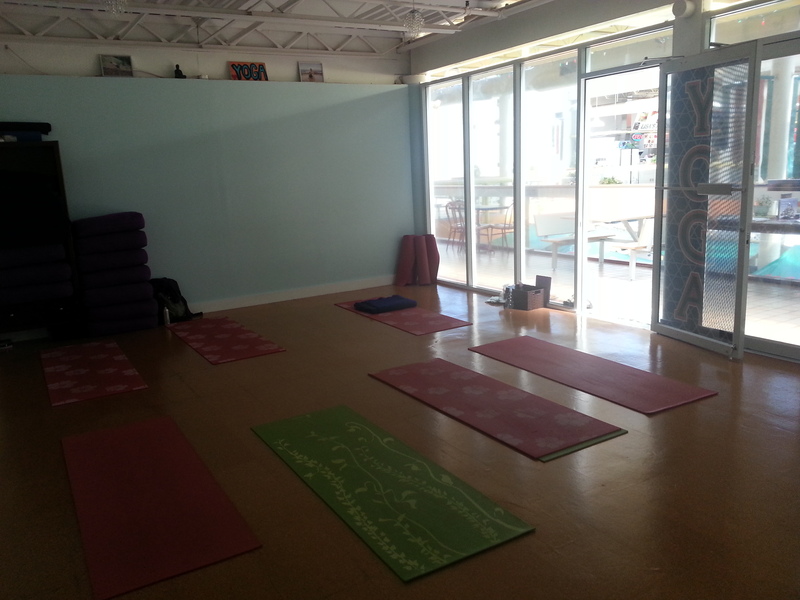 To my pleasant surprise the yoga space was simply a basic room with minimal decoration (there are 2 photos of people doing a yoga pose, a buddha statue and a handmade yoga sign on the high back wall). The room was only big enough to fit in 12 people, which was why, I found out when I arrived, students were supposed to sign up online for a space in class. Luckily, I was able to squeeze in as the last student and pay the drop in fee ($15). Our yoga instructor had an iPad to sign all of us in. Another delightful surprise awaiting me was that yoga mats were provided for free and already laid out for every student who signed up. Instead of using my travel yoga mat, I decided to use one of these mats. 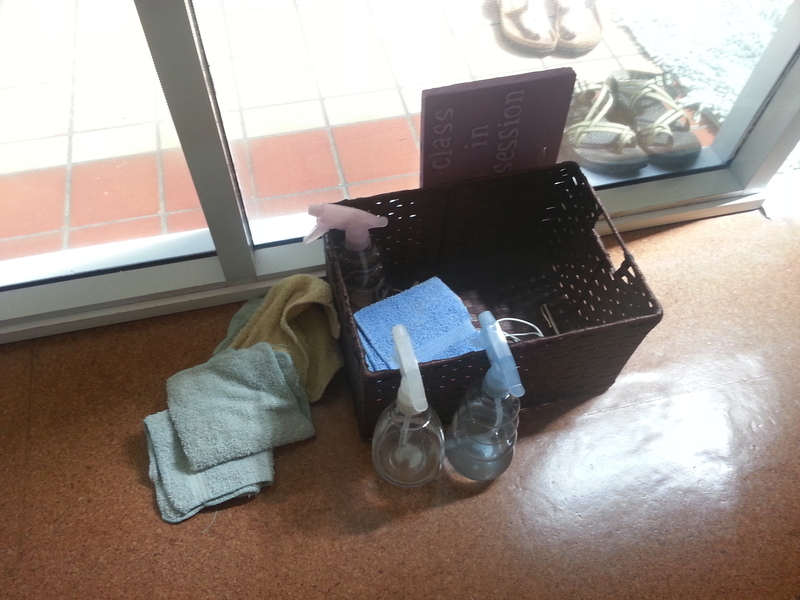 I really liked this idea and after class, we just had to clean the mat with the studio’s spray and towel. At the end of class, I had a chance to chat with Katy about this studio, life and the simplicity of it all. 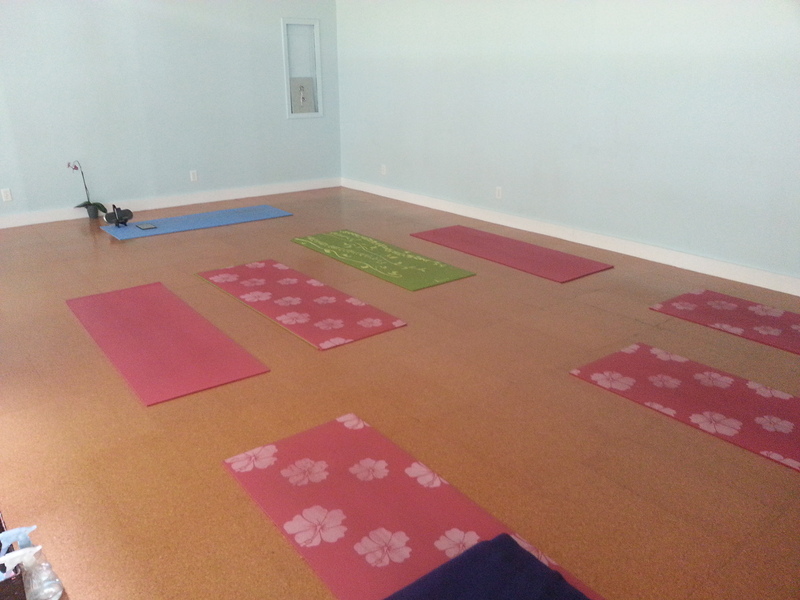 I learned that the owner of this studio wanted to offer a quiet sanctuary that is easily accessible and affordable for everyone in the neighbourhood; hence, Robson St. Yoga was created. This is why only the locals know about it. From my conversation with Katy, and this yoga studio, I learned that”less is more”. You don’t need a lot of fanciness to open a yoga studio or do yoga; all you need is a welcoming space (room) where the students feel safe to participate in an ancient healthy practise that’s good for the body, mind and soul. In the same way, keep life simple by following your heart and do what you love, and then you’ll find happiness and peacefulness: body, mind and soul. I think Robson St. Yoga is a true reflection of the simplicity of life and the use of a purposeful space for community building. 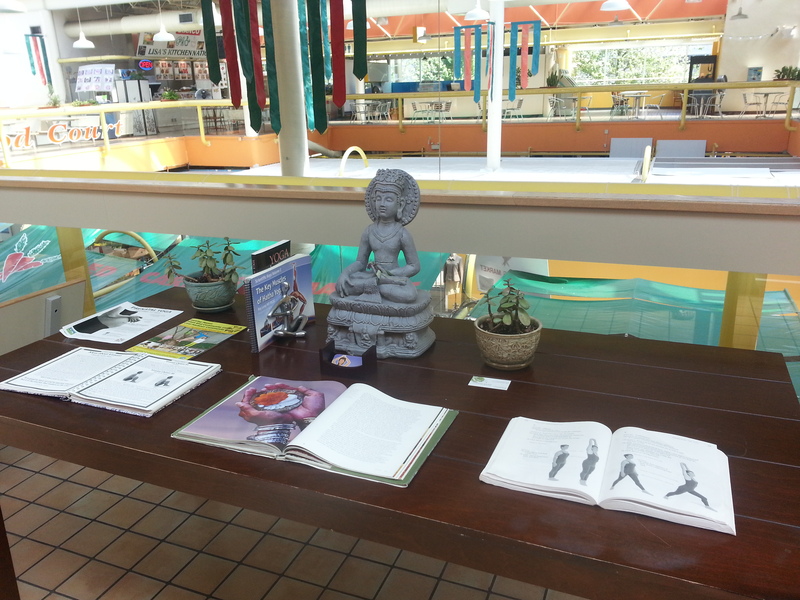 This inviting table is placed in front of the entrance door, and allows anyone in the community to browse through the resources and learn a bit what yoga is all about.